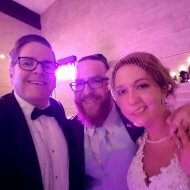 My sister used Alan as a DJ for her wedding. My wife and I were both impressed by his professionalism. When it was time for us to get married a year later, we knew we also wanted to use Alan for his services. His price was reasonable, he was very easy to communicate with, and he was very helpful setting up a timeline for our wedding reception (cocktail hour, food, first dance, etc). Alan was amazing and my wife and I would definitely recommend him to friends and family in the future!